After being routed, 15-3, in Game 1 of Sunday's doubleheader, the Rookie-level Raptors needed to have especially short memories. The Pioneer League championship was to be decided in the second game, so there was no time for dwelling on the rough opener. And dwell, they did not. Ogden rode a balanced offensive attack to a 8-3 victory over Great Falls in Game 2 of the twinbill en route to its first Pioneer League crown. "We said very litte in between games, the players dominated the dialogue," Raptors manager Mark Kertenian said. "They just got ready to get back to work and that's very characteristic of this group." Ogden got off to a quick start in the nightcap. Mitchell Hansen put the visitors on the board with a two-run double to right field in the first inning. Raptors starter Edwin Uceta backed up the offense by posting zeros in the first three innings and the 19-year-old righty received more support when Kevin Lachance came around to score on a wild pitch by Great Falls reliever Fernando Gallegos. In the bottom half of the frame, Tate Blackman lined an RBI single to left, but Ogden increased its lead after that. After Hansen drew a two-out walk, Brayan Morales tripled and Connor Heady doubled for a 5-1 lead. Devin Hemmerich took over for Uceta, and the lefty gave up a single and got two outs in the inning before being replaced by Zach Hartman. Logan Taylor singled in a run and the righty walked the bases loaded and balked home a run. Although that moved the tying run into scoring position, Kertenian stuck with Hartman to finish off the inning. Hartman broke the bat of the next hitter, JJ Muno, but both the shattered bat and the ball found their way to first baseman Luis Paz, who flipped his entire glove to a covering Hartman to end the rally. "That was a huge out," Kertenian lauded. "Zack had some challenges there that he dealt with very well, and then he broke a bat and Luis went for the ball without caring for the bat. It was our best play of the season." With the lead cut in half, the Raptors offense went right back to work. Paz and Romer Cuadrado hit back-to-back RBI doubles and Morales singled home another run to put Ogden up by five. 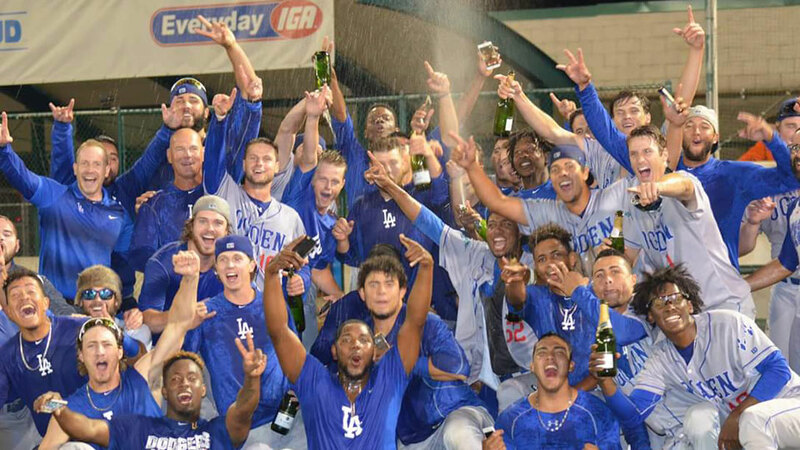 Conor Costello took over to begin the sixth and worked around a one-out walk to David Cronin to put the Raptors three outs away from their first Pioneer League title. Justin Hoyt was called on to close the game out and the 2017 17th-round pick did just that, retiring the Voyagers in order to kick off the celebrations. "They were fired up," Kertenian said. "They're happy for each other and they're enjoying each other. These guys understand that they are part of a good baseball team. They cared for each other and challenged each other, everybody feels very involved right now and they're expressing that." In Game 1, Ogden jumped out to a 1-0 lead in the first on Rylan Bannon's solo homer before Great Falls answered with eight runs, highlighted by Nate Nolan's grand slam to right-center, and three pitches later, Cronin's solo dinger to right. Leading off the third, Nolan went deep again for his fifth homer of the postseason. Cronin extended the lead an inning later with a three-run triple. The Great Falls No. 7 and 8 hitters combined for five hits and nine RBIs in the opener. Michael Leboff and Andrew Battifarano are contributors to MiLB.com. This story was not subject to the approval of the National Association of Professional Baseball Leagues or its clubs.